I'm getting "back-blogged" again! There is way too much good stuff to share with you. I can't tell you how much you add to my experience of making and trying new things! I'm pretty enthusiastic to begin with... you know this. Have you noticed my exclamation point usage?! (I even edit some of them from each post before I push publish!) But knowing I will be sharing it with you, well I never can wait. So I do have lovely pod prints on fabric... really. 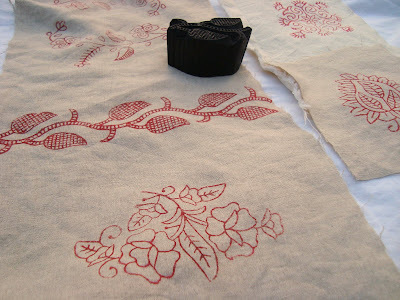 I'll show you soon, but didn't you want to see the Indian block printing? My mother and I couldn't wait, either. 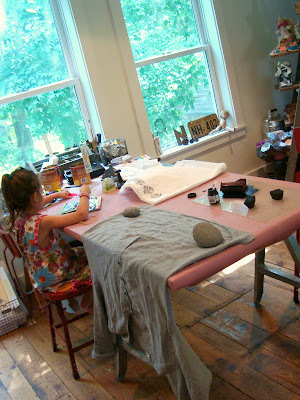 In fact, she whipped off the over shirt she was wearing as soon as she saw the first print on paper... "let's do this!" she said as she handed me her linen tunic. So this is our scene at the barn studio. Daughter doing her thing, son over on that big white bed reading a book, mom and me: printing like crazy! The tunic wasn't ironed, so what. Simple repeat border pattern around the hem. LOVE! Can't get enough of this! I will always prefer the satisfaction of carving my own blocks, but the history and craftsmanship of each of these teak blocks has satisfied me in another way. I really enjoy how each carving has different amounts of wear... there are softer images from the ones that may have had a lot of ususage. I love that! A new print that already has the faded vintage feel... because it is. I can't carve that element. Don't you get a rush from trying new things? Is there something you feel like diving into right now? I know you're probably super busy, but if you could clear the decks for say an hour or two... what would you try? Quick note: I know this will be asked! 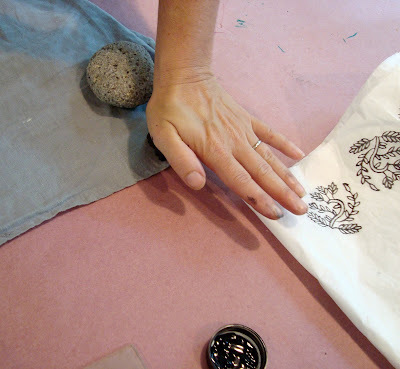 We used textile paint rolled on with a brayer. What a fantastic find! They couldn't have found a better home than with you. You're doing wonderful things with them! I'd love to do more improv quilting, but can't stray away from safe and matchy. Thanks, Sarah. Just the act of writing down your desire to improv quilt brought you that much closer! Oh I am so excited by these!!!! I would have bought them all!!!! How gorgeous! And totally agree with you about trying new things. I was thinking the other day that I am a serial binge crafter/arter. I get so excited about trying something new...do it for a while, until I find some new passion. Not that I ever give the other things up, but there are just only so many hours in the day. BTW, found your blog recently and I am SOOOO envious of your barn studio! Just gorgeous. Serial binge crafter/arter! Oh, I love that! I just love it! The designs came out so crisp! Lovely! I have just one which I found in a native shop but I never used it. They make beautiful prints. Great find! The wood blocks are great, what kind of ink did you use? I can't wait to see the shirt on your mother or hung so we can get the full effect. Loved my first visit to your blog. Beautiful pictures and the running comentary (so like myself) made me smile! I'll visit often! These blocks are amazing. You do great work! 1. I predict the whole Indian print thing is going to get even bigger than it is. 2. Those are awesome stamps. 3. That studio barn is my dream. The space, the light, the furnishings, and the kids playing along, doing their own thing while I do my art. Sigh. Hi Maya - I think I want to come live with your family in your mom's barn studio! The block prints are just lovely, and I adore your mom's enthusiasm - sometimes I have to buy knitting needles in the store so I can cast on immediately! If I could jump in and try anything right now, I think it might be carving. My dad does a lot of hand-carving and I'm fascinated by how he manages to take away all the bits that don't look like a bird (or polar bear, or coyote. Some day! ps - I can't bring myself to part with my coffee sack from Squam yet, so poor Aunt Kay is going to have to wait until October when I can hand deliver it! i have a vintage indian block that i use as a design element in my home. well, it was in my home & now it's in a box somewhere as we rent for a few months...i hope to try this once we are settled. those are so great. i love the prints. So beautiful! I have a few of these a friend gave me, and have been a little intimidated by them (I also like to carve my own), but now you've inspired me. I have had one of these blocks sitting in my window sill for years. I can't believe it never crossed my mind to USE it for something other than a pretty object. I'm getting some textile paint today! Thanks once again for the inspiration! Wow, I love these. Thanks for sharing such a beautiful idea. these are so gorgeous, i can't wait to share this post with my mom! i love all of your work and reading you blog. happy wednesday! Right now, I want to have a go at a crocheted bracelet like the one featured this week at The Purl Bee. OoooHHhhh, I want to play! Looks so fun. Those stamps are beaUtiful! I saw these in India and instantly fell in love with them. It was impossible to try and choose just a few to take back for my mom. Settled on a few designs and a medium size peacock. The tunic looks lovely. Thanks for the memories. these stamps are gorgeous! I want some! i love the repeat border patterns you and your mom have created. If I could drop everything and dive into something new it would be multimedia shadow boxes with Joseph Cornell as inspiration along with the natural world of course. I've had some similar blocks I purchased on ebay maybe two years ago, but haven't had as good luck as you. 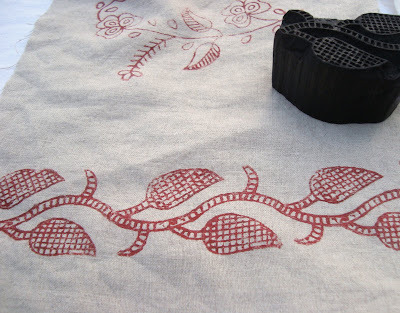 I've used textile paint, but curious, what kind of brayer (hard or foam) and how heavy of a pressure are you applying to get such great results?? 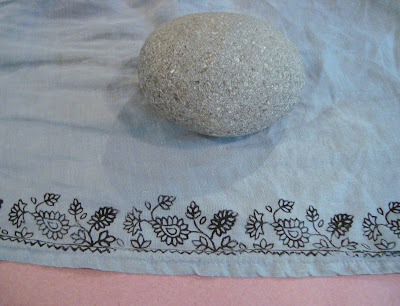 I just had some linen napkins made from a linen table cloth I salvaged and I"m now itching to print those! Wow! You're all as enthusiastic as I am!! I can't believe how many of you have a block or have seen them. Aren't they wonderful? I am considering using block ink, but for now I'm using Jacquard textile paint and a brayer with a medium roller... not foam and not hard. It's what I have the most success with. I am using a lot of pressure... standing up and using all of my weight to push down on the block. Fabric seems to work better than paper, although tissue paper was successful. Have fun everyone! Oh, and I love hearing what you'd love to be diving into. Hi Lily Boot, Lena Corwin's book is one of my absolute favorites! We bought our blocks at a huge antique fair last weekend. The two posts prior to this one give lots of details. I've heard that these blocks are available on e-bay, too. Happy printing! These are so gorgeous! And I definitely know what you mean about being 'back - blogged' (love the term - hehehe) I often have so much to share and just not enough time to write - then I realise weeks later - oh! I wanted to share that!! ANd I think you can see that I also have an exclamation mark problem - I usually try to go through and cut about half of them out of my posts- lol! holy cow, those are gorgeous! Wow! 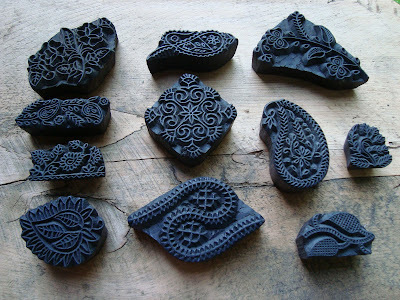 Those are exquisitely carved stamps - need to find me those! Love all the intricate designs and I can just imagine how fun it is to play with those! Lovely! I LOVE this maya. Didn't it come up beautifully. Gorgeous! I need to whip out my brayer and start some printing! Oh so lovely Maya! I love trying new things too. There is SO much that I want to do. I want to create some paper art at the moment - folded, cut, sewn, embellished etc - I am determined to make the time. Maya, I came upon a store in Vancover, BC recently filled with beautiful yarns, hand printed fabrics, natural dyes and paints, AND, these block prints. I love them and found a few for myself. Can't wait to try them. I will feel like I am back at Squam in your wonderful classroom overlooking the lake all over again. But really want to handpick some from india myself. Iwillbe in bombay for a short period of time. Thanks for your help.